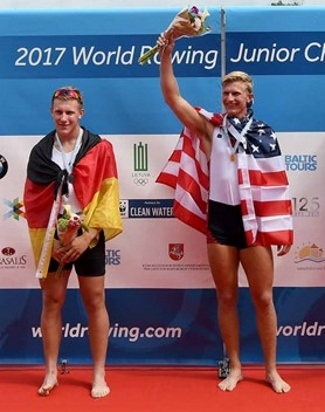 Moritz Wolff of Germany (left), silver medallist at the 2017 World Rowing Junior Championships, and Clark Dean of USA, gold medallist. Photo: FISA. In a press release today, USRowing writes that Clark Dean set a new record time at the World Rowing Junior Championships in Račice, Czech Republic. (Here slightly rewritten by HTBS). After setting a junior world’s best time in his first heat at the World Rowing Junior Championships at Račice, Czech Republic, U.S. single sculler Clark Dean, saw it broken in the quarterfinals by German rival Moritz Wolff. However, Dean managed to lower the record by almost five seconds in winning his semifinal today, Saturday, in Račice. 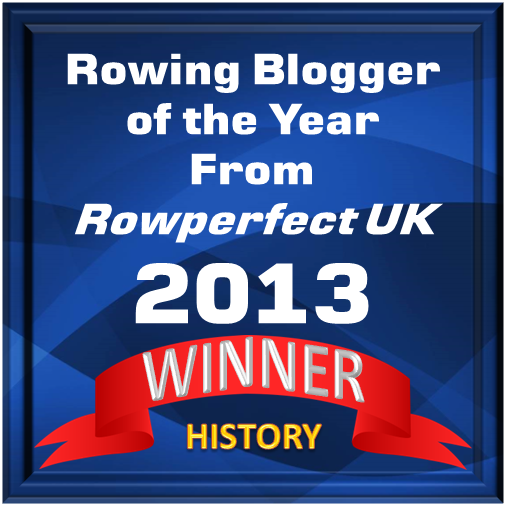 Racing in the second of two semifinals, Dean, the defending world champion in the event, grabbed a lead in the first 250 meters before Australia’s Cormac Kennedy-Leverett took the top position as the scullers crossed the 500-meter mark. Nevertheless, the Australian’s lead was short-lived as Dean moved back into first at around 750 meters and began to pull ahead. Dean continued to build his lead in the third quarter of the race before putting on a strong sprint to win by more than six seconds and set the record. Dean finished with a time of 6:45.45 ahead of Kennedy-Leverett. Belgium’s Tristan Vandenbussche finished third. The three scullers will join Wolff, who won the other semifinal, Belarus’ Ivan Brynza and Italy’s Gennaro Di Mauro in the final. In a day that saw junior records broken nine times, Dean’s semifinal victory was one of four on the day for the U.S. team. In addition to the men’s single, the men’s four with coxswain, women’s pair and women’s four won their semifinals to advance to Sunday’s medal races.